Preheat oven to 450° F. Spray a 24-cup mini muffin tin generously with coconut oil spray. 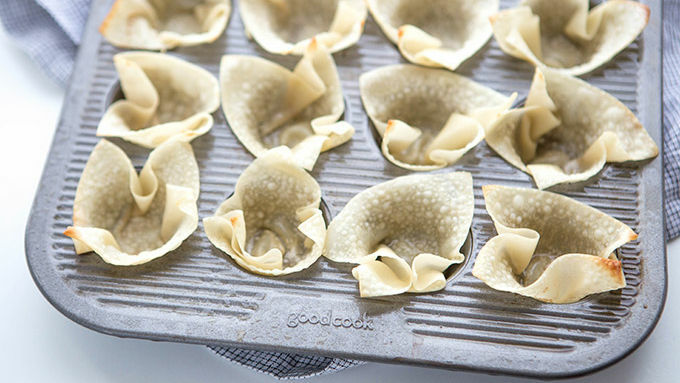 Press wonton wrappers into each cup, pressing against sides of muffin cups to create a wide open “bowl” in the center of each wonton. Spray wrappers generously with coconut oil spray. Bake in oven for 5-6 minutes, or until the tips turn golden brown and the wrappers begin to bubble. Remove and cool. 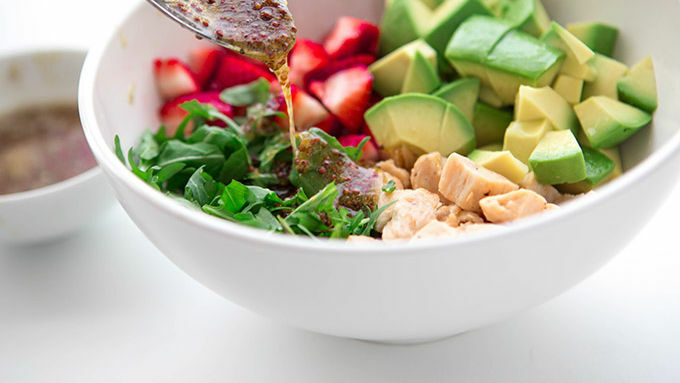 In a large bowl, toss together chicken, strawberries, arugula and avocado. In a second bowl, mix together juice and zest of lime and orange, mustard, honey, olive oil and salt. Drizzle immediately over chicken mixture. Toss. Spoon into cooled wonton cups. Serve immediately and enjoy! Perfect for parties, baby and bridal showers or any springtime entertaining! Every one in a red hot while, you come up with a recipe idea so good, so beautiful, so splendido gorgeouso, that you felt like birds are singing just for you. You feel like trees are bursting forth in bloom just for you. You feel like the sun is shining just—okay. Maybe I can’t tell the difference between my thrilled excitement that SPRING IS HERE, and my excited thrillment that THIS APPETIZER ZOMG. Regardless the reason, there’s one way to celebrate the season of Spring. And that is fast, fresh eats, surrounded by friends you j’adore. It’s face-meltingly gorgeous. And utterly excitable. And now I simply must show you how to make it, because in less than 15 minutes it can be all yours. Avocado, chicken, arugula or spinach, and bright red strawberries are all tossed together into this gloriously fresh mix. Drizzle on a simple homemade citrus honey mustard dressing. Which doesn’t just taste INCREDIBLE with this ingredient combo. The tiny little wholegrain mustard seeds glazed atop our garden mix look irresistible and inviting too. Quick tip: I’ve found it’s easiest to fill the cooled wonton wrappers while they’re still sitting in the muffin tin. That way, any of the salad that falls out as you spoon it into place doesn’t get on your serving platter. With cups filled to the brim, you’re ready to serve! Call the friends over and share. 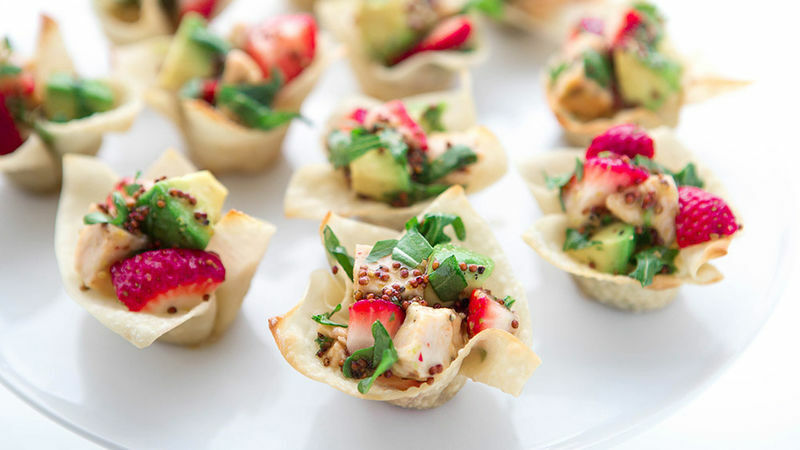 This is what springtime is all about… fresh food, friends—and the prettiest dang appetizers in the world.